WebManager’s Staging screen was designed as a place to prepare your vehicle listings before you push them live on the internet. If you have a WebManager prepaid plan, you won’t be able to make very many changes to your vehicles once they are designated as Live. Therefore, we recommend doing the majority of your work in the Staging section. To access the Staging screen from anywhere in WebManager, hover over Inventory, then click Staging. You will now see a list of all the cars you have in Staging. Each vehicle has a shield associated with it. 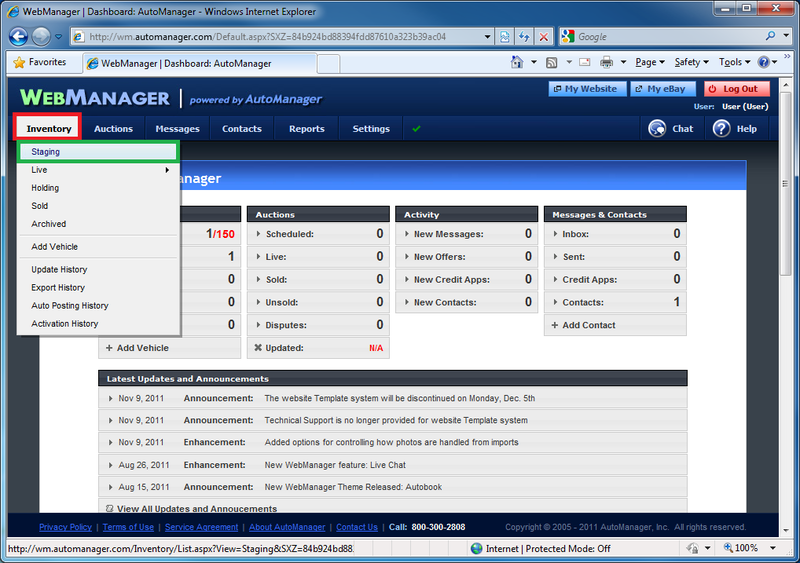 The green shield means that car is ready to go to Live; the red shield means WebManager has some issues with that vehicle. If you hover over Errors, WebManager will tell you what the problem is. To clean up a vehicle, click on that vehicle’s year, make, and model. Once in Staging, enter the Vehicle Details screen to make sure your information is correct. Once inside the Vehicle Details page, you can make a number of corrections. If you click the Decode button, WebManager will decode your VIN again. If you are using Internet Explorer, WebManager will show you most of the issues it has with your vehicle by noting them in red text. Once you’ve finished cleaning up the vehicle details, click Save & Exit. Please note that there are many other steps that can be taken to process your vehicles before you send them to Live. For example, you can edit pricing information, description, features and warranty information. When the shield to the right of your listing turns green, it’s ready to upload. After clicking Save & Exit, you will be taken back to the Staging screen. If you made all the changes that you need to make, the shield to the right of your vehicle will now be green. If it is still red, hover over Errors again to see what’s wrong. Click the checkbox to the left of any vehicle(s) you would like to send to the Live section, then click Activate at the bottom left of your screen. You can also click the checkbox at the top of the list to check all of the vehicles on the page.